Thanksgiving is here !! Thinking about dessert again for the Thanksgiving, as boys are going to be home. Two years ago I found the recipe for Luscious Four layer Pumpkin cake on Kraft website. This recipe was with Nutty (pecan) caramel topping. My youger son does not like nuts and gets some throat irritation with walnuts or pecans. I had decided to make this with Kit Kat candy and topped with chocolate shaving. I made this two years ago. I had sent this to one of our dear family friends who always invite our son for their Thanksgiving feast. They loved it !! I will post the recipe with my variation and also the recipe for the caramel sauce if you prefer to top with that. * You will need 12" spring form pan or two 9" round cake pans. * Beat cake mix, pudding mix, 1 cup pumpkin, milk, oil, eggs, sour cream and 1 tsp spice in large bowl. * Mix until well blended. * Bake for 35 min or until the inserted toothpick comes out clean. * Cool cake pans for 10 min. * Remove cake from pan and cool completely. * Beat cream cheese in a bowl with mixer until creamy. * Add powdered sugar, remaining pumpkin and spice. * Mix well, gently stir in cool whip. * Mix until everything is well incorporated. * Make a horizontal cut around side of the cake, using long serrated knife. * Remove the top layer by sliding a round 9-12 inch cardboard round, keep aside, repeat this process making three slices. * Carefully place the bottom layer of cake on a paper dolly on a serving plate. * Frost the bottom layer with 1/3 of the cream cheese frosting, then slide the second layer with cardboard on top of bottom layer very gently and repeat the process of transferring layers to stacked layers with card board circle and repeat frosting. * Finally frost the cake all the way around. Break the Kit Kats in to single sticks and stack them around the cake making a fence like structure around the cake. 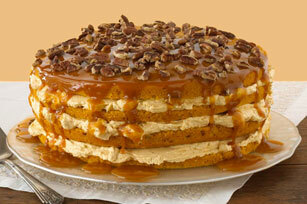 * If you wish to use caramel sauce with pecans as topping, you don't frost the top layer of cake. For the caramel sauce you would need 10 caramel square, 1 tbl spoon of milk and 1/4 cup of chopped pecans. * Microwave both on high for 2 min or until caramel begin to melt. * Stir until caramels are completely melted. *Drizzle over cake just before serving and top with nuts. Photograph of caramel topping from Kraft recipes website link as follows: http://www.kraftrecipes.com/recipes/luscious-four-layer-pumpkin-cake-65930.aspx. Chop the Macadamia nuts to desired consistency in food processor. Add evaporated milk and condensed milk, beat until all ingredients are well incorporated. Beat with hand blender until everything is smooth and well blended. Add whipping cream and nuts. Add whipped topping and mix well with hand blender. (if making in two batches, may want to hold off on adding entire tub of whipped topping, and add to second batch just before making the ice cream next day. Pour 1/2 of content in 1 quart ice cream make and put the rest in fridge. Follow direction on the ice cream maker. Takes about 30 min to make 1 quart at a time. Scoop out the ice cream in freezer safe plastic container and freeze until serving. Pour the ice cream in same container freeze the ice cream and serve as needed. You may top it with desired topping or just serve plane. This recipe yields 2 quarts of ice cream, therefore I had to make it in two batches, since the Cuisinart ice cream and yogurt maker has only one quart container. I made one batch one day and had to freeze the empty ice cream container to make the next batch next day. Stored the rest of the mix in the fridge. Only thing is you may want to add the whipped topping to the mix just before making the ice cream. If you have ice cream maker with bigger container or have two ice cream containers you can make both batches on same day. 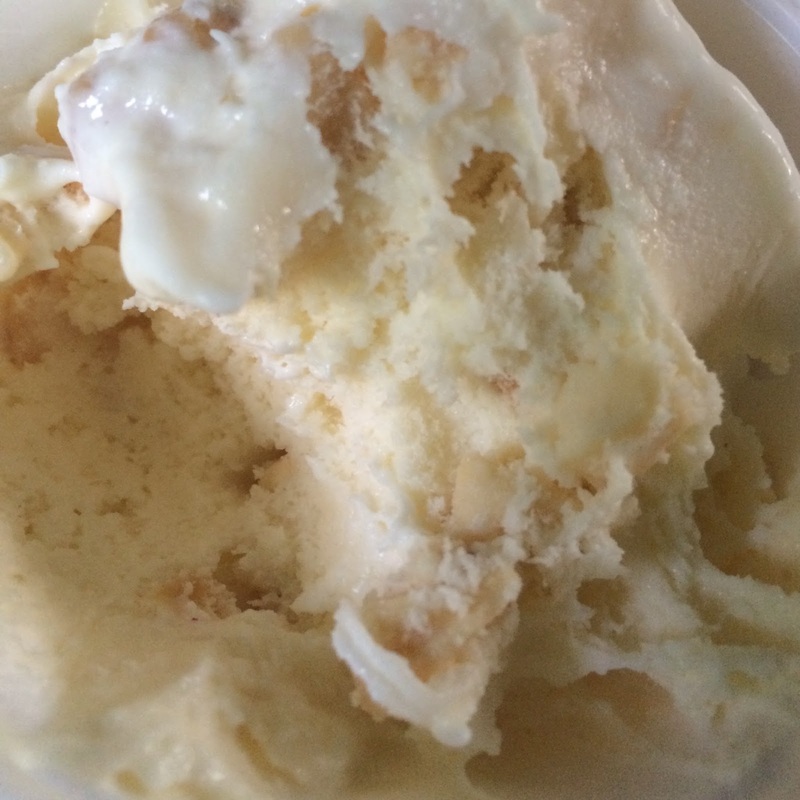 I used 3 cups of Macadamia nuts because the ice cream that we tried in Hawaii was loaded with nuts. If you desire less nuts, you can cut down the quantity to 2 cups of nuts, but may want to use less sugar. 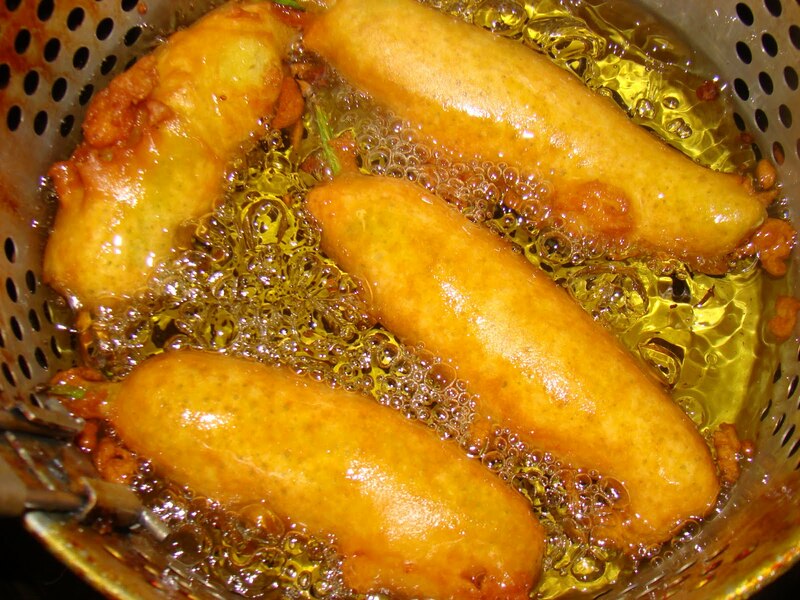 Instead of using Caro syrup and sugar you can use one entire can of condensed milk. Instead of using heavy cream you can use coconut milk or half and half.